The new patented SolarOrganite® process is effective in reducing cost for biosolids, septic waste and can eliminate the need to transport leachate from your landfill. Eco Sciences, LLC offers turnkey solutions that SAVE MONEY and reduce your municipality’s carbon footprint while saving on transportation and other disposal costs. Using a newly patented technology, our end product is Class AA Biosolids fertilizer, meaning it can be reused without risk to people health or the environment. Traditionally, biosolids (sludge) disposal involves trucking it to rural areas, land spreading in fields and pastures, incineration, adding chemicals or just dumping into landfills. However, concerns about contaminants, runoff, air pollution, tipping fees and transportation costs have resulted in cities and municipalities looking for better, more cost efficient ways to handle the removal of sludge from Wastewater Treatment Facilities without hurting the environment. Eco Sciences, LLC helps clients manage their capital cost, energy use, conservation and Biosolids disposal needs through solutions that are safe, environmentally friendly and that will positively impact their bottom line. • We use ONLY natural sunlight to dry the biosolids and through our patented process biosolids reach pasteurization temperatures that destroy pathogens and removes vector attraction. • Particulates from the process are converted to a licensed fertilizer and can be used in any agriculture, landscape or farming properly. NO RESTRICTIONS. • Beneficial reuses are found for the dried material, which is reduced by 90-95 percent of its initial weight. 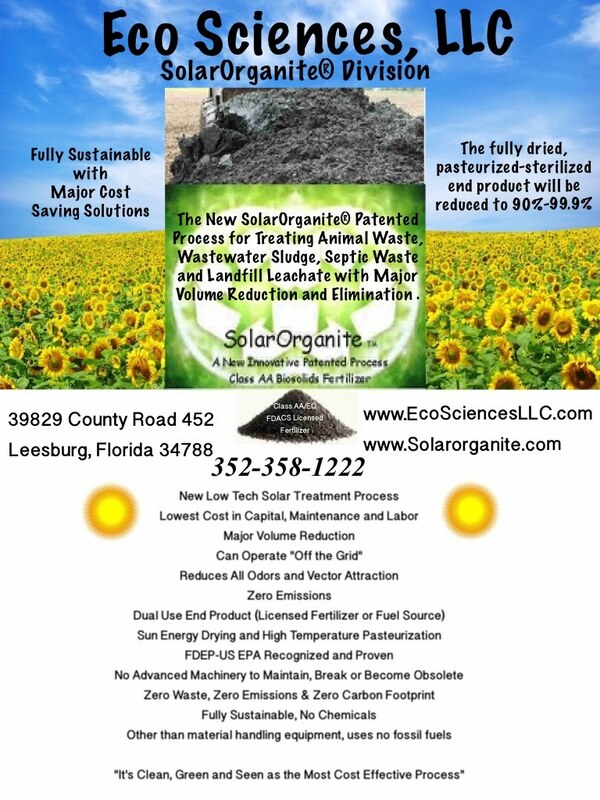 • We can establish a biosolids SolarOrganite drying facility at a location that allows for the efficient use of your resources – eliminating or minimizing the need for transportation. No more expensive trips to haul heavy biosolids hundreds of miles. No more straining overburdened landfills. No more money need in your sludge disposal budget. Additionally, with innovative, environmentally-oriented thinking, you’ll have an excellent story to tell to your community. The SolarOrganite Division is here to help you whether your problems are sludge, septic waste and landfill leachate? We can develop an innovative, proprietary and cost effective ways for the remove of biosolids from your wastewater treatment facilities, process septic waste and eliminate hauling leachate from your landfill. It is clean, green and seen as the most cost-effective process for Safely converting Sewage Sludge and Septic Waste into a Class AA/EQ Licensed Fertilizer. Call Today and your problem will be solved ASAP.